Top　»　Exhibitions　»　Shinobu Hanazawa "Utsutsu"
Bambinart Gallery is pleased to present "Utsutsu", a solo show by Shinobu Hanazawa(born in Kanazawa, 1989) currently enrolled at Tama University of Art. Shinobu Hanazawa mainly exhibits drawing and painting. In her works, various animals and multicoloured flora are painted with her distinctive brush strokes. Also, in these surroundings, human are dancing or hugging each other with mixture of happiness, sadness or some other emotion on their face, which creates a world that is a cross between this life and the next life. Also, Hanazawa has attempted to unite her paintings and the environment that surrounds them, such as putting her work in a field or on the ground outside, or exhibiting a large canvas work which is about 4 meter in size on a vaulted ceiling . She considers the world in her painting to be not only in the imaginary field, and we could see it is permanently together with her own world. "I dearly nurtured a banyan tree and this dandelion blooming on the roadside, and both have a beautiful soul. Bird flies in the sky and tiny insects are also a shade of beautiful spirits. For some reason the world appears in me and the world I see is myself. Beautiful tears are always in the back of the eyes. We are living, praying and one we day die off like the beautiful and happy form of a flower that has blossomed and then withered. These are the things I should tell my loved one I should say everyday "I loved you, and good bye." I want to cry wistfully, sadly and look on while my loved one cries, laughs and passes away happily. I hope my last painting just before dying will be wonderful and tender, and I want to make paintings like that. Either someone who is not in this life, someone whose name I don't know or even someone who is not human." 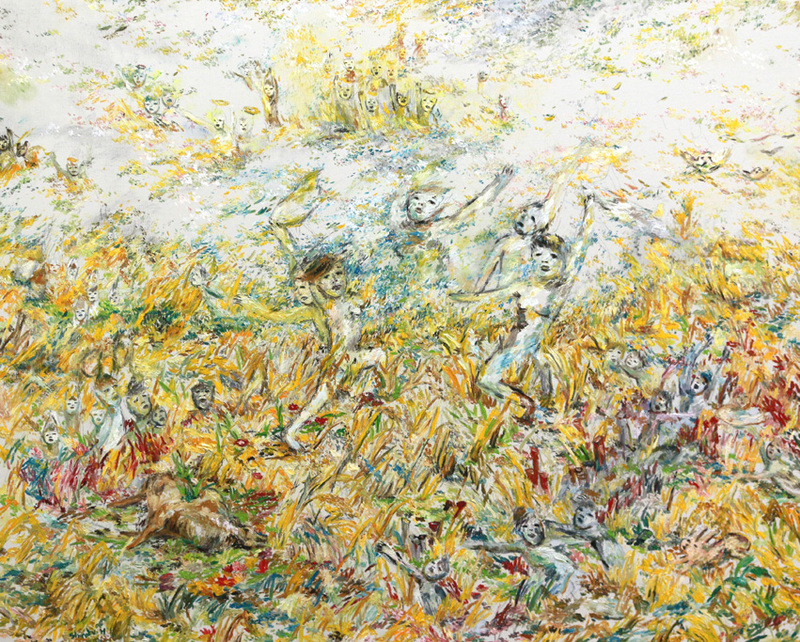 It could be said that knowing the transience of life and affirmatively trying to accept it makes the colour of Hanazawa's painting more vivid, and the creatures in her paintings display emotion and true enjoyment of life.